Can Cats Learn to Play Fetch? 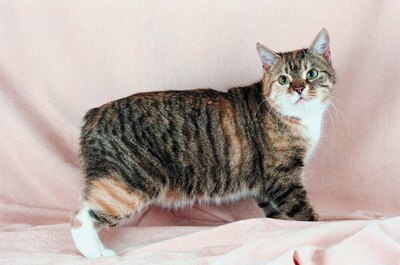 Purebreds like the Manx may be more likely to engage in fetch behavior. While fetch is typically doggie terrain, many cats can learn to play fetch. The learning curve depends on your cat's personality and your dedication to regular training. Use pet treats and a clicker with a wand, available at pet stores, to train kitty. Clicker training allows you to click when your kitty does a desired action -- in this case, fetches something. To start clicker training her to fetch, spend time playing with her favorite toy together. After she's engaged in play behavior, throw the toy across the room. Watch for her response. If she goes to fetch the toy, click then offer her a treat. If she doesn't touch the toy, load a treat into the clicker wand and touch the toy with the wand. When the sight of the treat sends her running, click to reinforce the desired behavior. Once kitty understands the basics of working with the clicker and retrieving or going to the desired object, start teaching the concept of "fetch." First, delay treating her until she picks up the toy using her mouth. Once she understands she needs to pick up the toy in order to get that treat, up the ante again. Use your clicker wand to point toward you, so she understands she needs to come to you -- with the object in her mouth -- for that treat. Consistency is key to reinforcing this new behavior. Practice retrieval and fetch behavior in short sessions multiple times a week. Breaking the concept of fetch down into small tasks helps kitty grasp each task and put learned tasks together to play fetch. Certain cat breeds may be more inclined to fetch. The Bombay, Chartreux, Ocicat, and Manx have all been known to play fetch. While the behavior may be more pronounced in purebred kitties like these breeds, you can teach many house cats to play fetch. Can You Teach an Adult Labrador to Fetch & Swim? Do Cats Have a Dominant Paw? Do Cats Automatically Use Cat Litter?